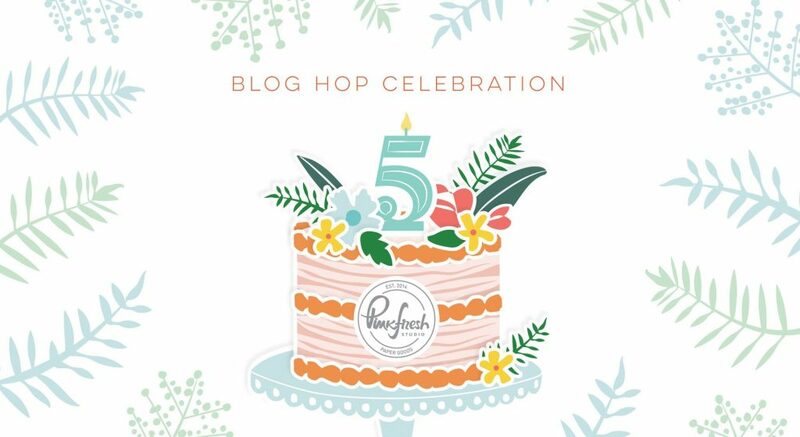 Welcome to Pinkfresh Studio 5th Birthday Blog Hop! 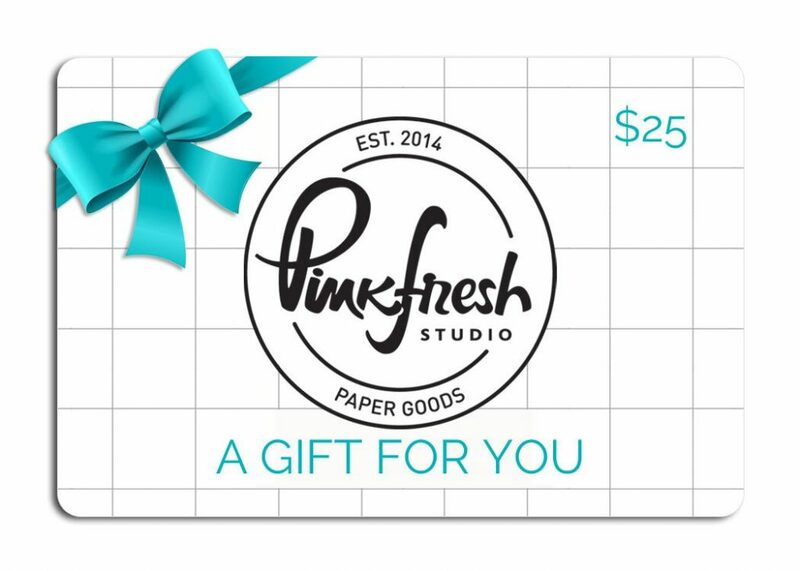 Hooray for Pinkfresh Studio for their accomplishments for the past 5 years. And here is for the next 5 years, 10 years and many more to go! My today’s card features some of new products that were released in January. Hope to inspire you before the new release coming up on board in a few days! I did a little bit experiment this time. Instead of making my usual ink blending background, I chose one sheet of pattern paper from Pinkfresh Studio Everyday Musing’s 6×6 Paper Pad. I die cut it slighter smaller than A2 size and lightly inked the edge with Tim Holtz Distress oxide ink in Worn Lipstick to contour the frame. I adhered it onto am A2 card base and set aside. Now I started to build my focal piece. I die cut the floral frame using Circle Frame with Botanicals Die out of piece of Pool Blue color cardstock paper. Then hand cut a circle that fits underneath this frame out of a white cardstock paper. I ink blended this white cardstock paper using Tim Holtz Distress oxide ink in Squeezed Lemonade and Worn Lipstick. I stamped “Hooray” sentiment from Scripted Bold Sentiments 2 Stamp set with Versafine Tuxedo Black ink. After attaching the frame over the bottom circle using Foam strips, I also adhered the whole whole thing to the center of my prepped card background. I stamped “It’s your day” from Scripted Bold Sentiments 2 Stamp set again over a piece of black cardstock paper using versamark ink and white embossed it to finish. I hand cut it into a skinny rectangle strip and placed underneath of my bigger sentiment using Foam strip. It is embellishing time! I added yellow jewels around the frame and different sizes of sparkling clear sequins scattered in and around the frame. I hope you love this card! There are LOTS of talented designers are joining us. Be sure to check out their blogs to be inspired with overdosed inspirations! I will be also giving away a $25 giftcard on my blog post. The winners will be picked from all comments below. 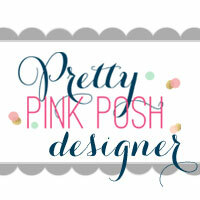 The winners will be picked and posted on Sunday, March 14th on Pinkfresh Studio GIVEAWAY PAGE. You must check that page & claim their prize within 2 weeks. 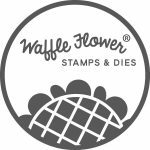 You will receive a free die (XO word) with any purchase. No code needed, the die will automatically load into your cart while supplies last. Pinkfresh is also offering free/discounted shipping from April 5-7th on orders $25+. They must use the code FREESHIP5THBDAY. Shipping is free in the USA, and $5.50 off for our International friends. Your card is lovely. The paper was a good choice. Your card is so pretty. I love the frame. Adorable cards! Love the spring colors. Love the colors and soft background! stunning card – the background is amazing !!!! The little details make this card a standout! Beautiful card and I love these colors and the wreath is so pretty. Great job! Adorable creation Alix…thanks for sharing!! A beautiful card….. lovely colors, pretty frame and the perfect sentiment!! Very pretty… I love the floral wreath! Very nice… the blue wreath really pops on the pink background. I am also loving the Scripted Bold sentiments… they are lovely. A very nice card with a fresh look. Beautiful color combination, and I love the way the pool pops against that amazing background paper. Lovely! Great card with fantastic color combinations. Lovely colors and simply sweet! This is a beautiful CAS card. Love the background and its color. I love that die and your card! I really like the background. Very cool! Love the simplicity of your card. Thanks for the great inspiration! Pretty. Are. I love that botanicals frame it’s so versatile. I love the patterned paper background too. I really like the background too! Nice idea. Love the frame and the sequins are the perfect addition. Very pretty card! I love the font of the Scripted Bold Sentiments! I love that idea … i’m going to have to try that! Beautiful card! 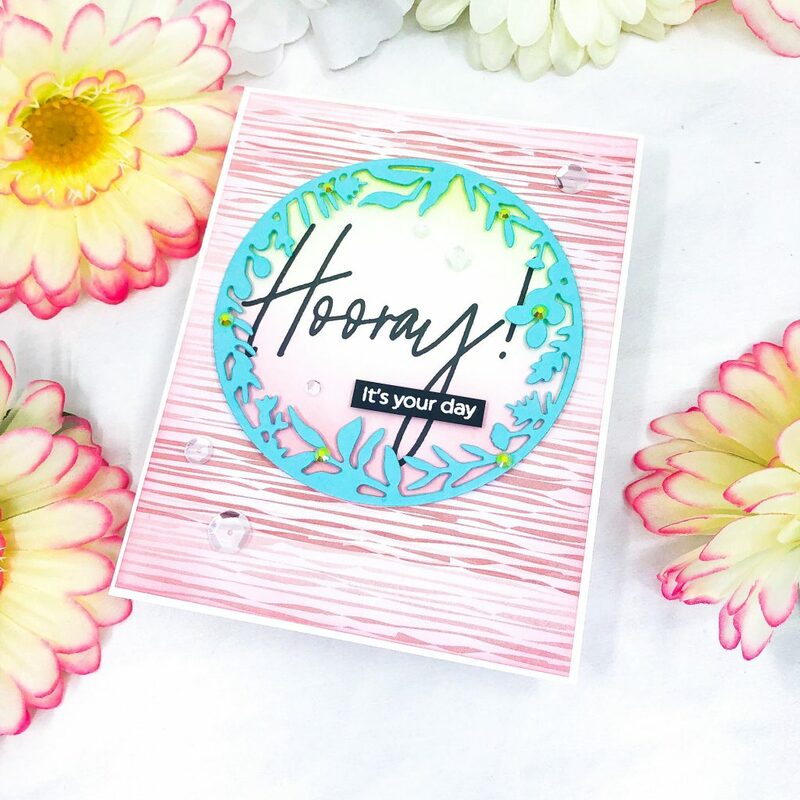 Love the pretty circle frame die! I do love your card! Very pretty. Thanks for sharing on this wonderful Pinkfresh Studio blog hop! Very pretty, Alix, I love the font of that sentiment! Beautiful card! Love the colors! Thanks for the inspiration! Beautiful card! I love this floral frame die! Great card! I love rthe floral wreath and I love the background paper. Great choice of contrasting colors. Very nice, great colors . Thank you for sharing. Great card – so many little details! Such a pretty card. I love the background paper and the gorgeous botanical circle. Peacefully colored card Alix! The hint of yellow behind the blue Circle Frame with Botanicals Die cut SINGS to me!! a bit of a different look for you, but still gorgeous. i like the ink blending on the inside. Very pretty CAS card. I love the colors you used. The embellishments add so much! 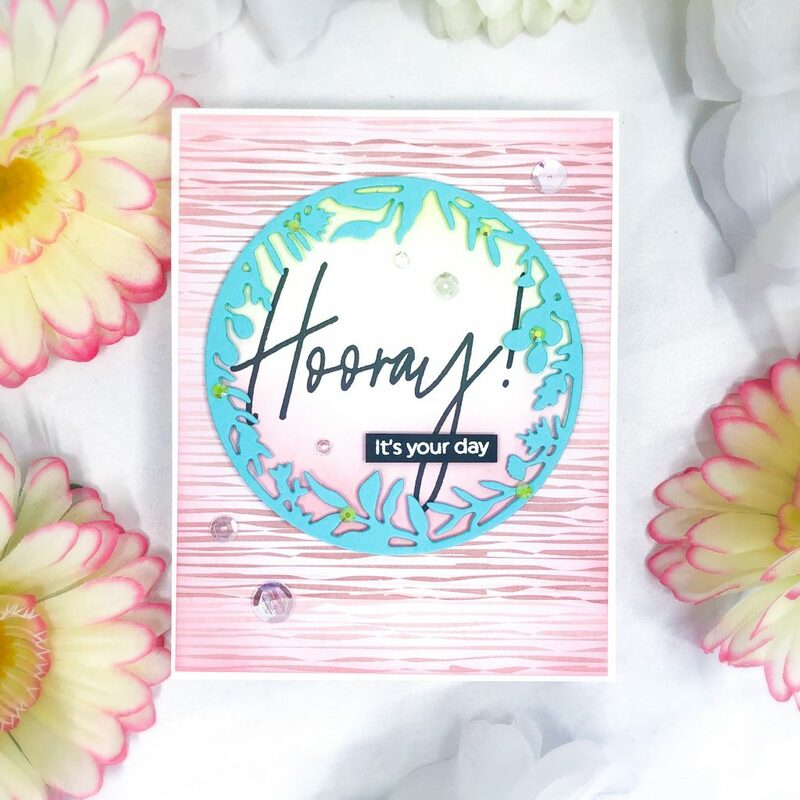 Love how you used the circle frame with botanicals die. What a wonderful card! Thanks for sharing your creativity! Beautifully done with ink blending and all. Love the scripts font for Hooray! I love your beautiful card. Very clean and springy!! Love that circle die. It’s a must have in my collection. BEAUTIFUL! Love that scripted sentiment, such a beautiful font! Wonderful card Alix! I like the ink blending inside the circle die & the Botanical Die in blue is beautiful. Thanks! Pretty card, Alix! I love how you used the patterned paper. I do this often when I make cards. The circle frame is so beautiful, especially with the yellow jewels. Beautiful card, love the botanical die. A very cute card and I love the circle frame. Very pretty card. Love the pattern paper you have used in the background. Congrats to Pinkfresh Studio on completing 5 years. I love your products. Wishing you many more successful years ahead. Beautiful card, love the ink blended edges on the pretty patterned paper! The Botanicals frame is perfect on this beautiful little card. So pretty, love the frame! The inking on the background paper worked perfectly. And I love Pinkfresh’s frames. Thanks for sharing with us! Love your blending. Mahalo for putting on such an awesome blog hop! I am in love with everything the design team has created!! Good luck everyone! Very pretty!! 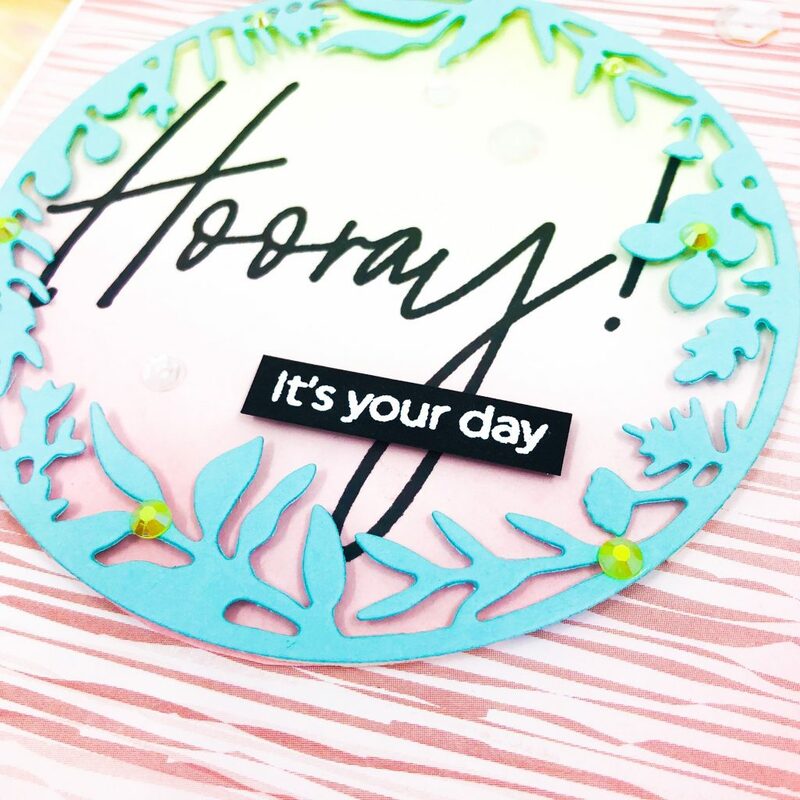 Love the ombre blended background inside that lovely wreath die-cut. A brilliant card, love the design. I love the giant HOORAY sentiment! Just lovely! Love the botanical circle frame die, and the jewel embellishments you added goes so perfectly! What a pretty card! Beautiful design and stunning color combination. The colors in this are so playful. Very nice combinations. Love how the blue pops on that pink background! I luv designs like this that can be used for almost any occasion. great card! !